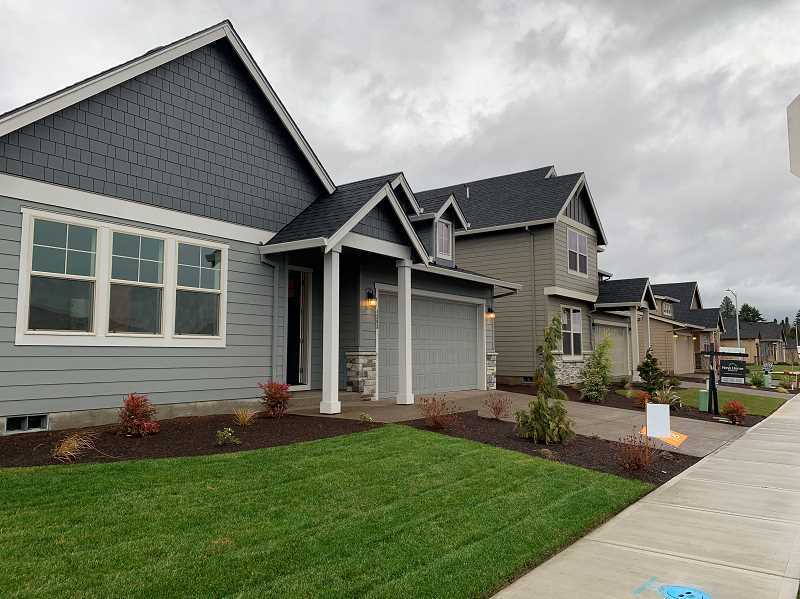 Stafford Homes and Land recently relocated from Lake Oswego to Wilsonville to move closer to its projects. Yet, as of now, the land and housing development company doesn't actually build in Wilsonville. Instead, its focus is lasered inside the Willamette Valley but outside the metro area's urban growth boundary. "It just made a lot more sense for us to be here than in Lake Oswego because we don't have to pay employees to go from Lake Oswego south anymore," Principal Gordon Root said. Stafford Homes and Land, located at 8840 S.W. Holly Lane, builds homes and large scale developments in cities like Dallas, Silverton, Woodburn, McMinnville and Dundee because regulations are less cumbersome, system development charges cheaper and buildable land more abundant. Stafford Homes built about 80 homes in 2018. Some of its homes include a large backyard and a three-car garage, features Root said would not comply with Metro density requirements. "You can't put swing sets in the backyard anymore (in the metro area) because they will hit the fence and hit the house (because there isn't enough space)," Root said. 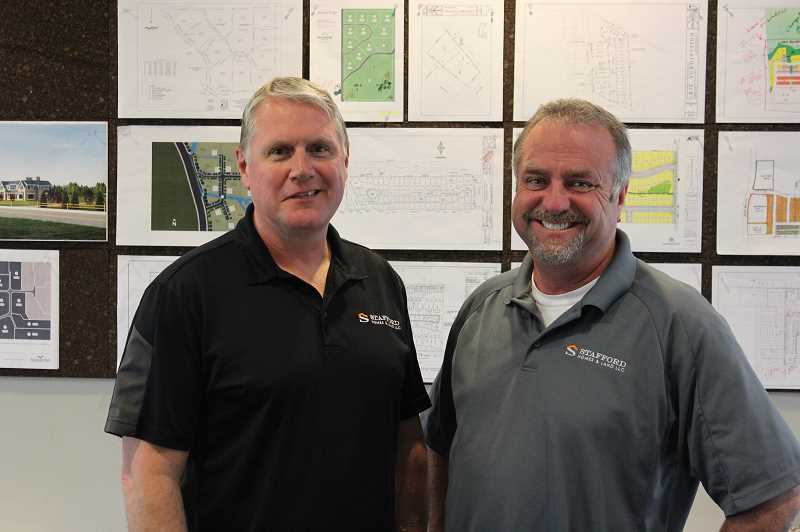 Regarding current land development, Stafford has built or is building a 150-acre, 823-unit development in Woodburn, 280 lots in McMinnville, 187 lots in Forest Grove and 63 lots in Mount Angel. And Root said greater land supply makes these projects possible. "We have the ability to do large developments in the smaller towns, which you don't have the land supply for in Wilsonville or anywhere in the Portland metro area," Root said. "To even conceive that we are going to annex 150 acres and build 823 units anywhere north of that river, you can't do it." Root and fellow Principal Rick Waible, who lives in Wilsonville, said Stafford's projects are more varied than the average development. For instance, their McMinnville project includes seven housing types with myriad price points. "So you can make your friends, stay there, stay with your community and move up and down the community itself," Root said. "It's very much the same philosophy as Villebois." As for its homes, Root and Waible said they are better insulated and have higher air quality than the average residence. They place the furnace in the interior of the home rather than the garage to prevent car fumes from invading the rest of the house and provide thermal sealing and quiet fans to keep the air flowing in and out of the house. And they said this commitment to air quality and insulation is less predominant outside the metro area than inside of it, which gives them a selling point over competitors. "Our homes are built 40 percent better than code. What we do is we put in a pretty nice high performance package and make sure insulation is better, heating is better, circulation of the homes is better, air flow is better," Waible said. "We just decided that if we are going to build production homes we want to build the most efficient and the most healthy ones we can and that supersedes quite a bit of the competition, especially where we build." Waible and Root own the Tumwater Vineyard in West Linn and won many awards for their NW Natural Street of Dreams development at Pete's Mountain in 2016. They also plan to install a publically available wine cellar at their new location in Wilsonville. "We think the market is strong for that here in Wilsonville because people are middle to upper middle income and they start to become a connoisseur of wines and want to buy finer wines and have a place that's conditioned and secure," Root said. For more information about Stafford Homes and Land, visit http://staffordhomesandland.com/.